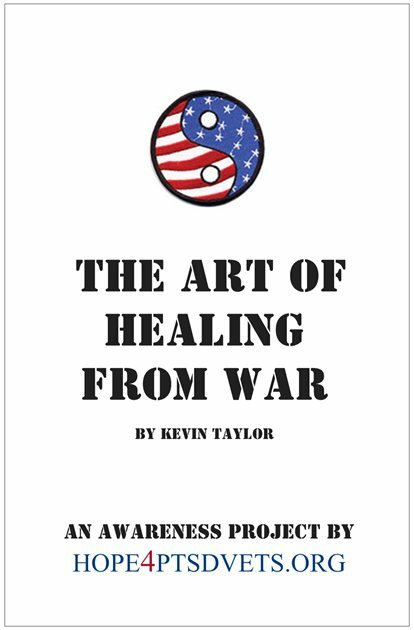 The Art of Healing from War is a short book written to increase awareness and provide veterans wounded by trauma, with hope, encouragement, and some simple tools and tactics they can utilize to help combat the effects of trauma/PTSD. If you would like to sponsor a book for a veteran or help us bring this important work to print click here. If you are a veteran wounded by trauma and would like an e-copy of the book click here. If you opened up this book with the intention of reading it, you may be wondering if you or someone you care about is experiencing combat trauma or Post-traumatic Stress. The following questions are to help you answer that question. Obviously, you cannot obtain an official diagnosis from answering these questions but you can determine whether or not you are experiencing some of the symptoms of Post-traumatic Stress. While serving our country’s armed forces, in a theater of war, did you have an experience or experiences which wounded you emotionally (and perhaps physically as well), to the point you cannot shake the racing thoughts, emotional pain, guilt, or even shame of that event or events? Do you often feel alone, odd, flawed, angry, that no one truly understands you, what you have been through, the sacrifice you made, or the pain you carry with you? Do you isolate and detach from those closest to you?Are those close to you surprised when and if they see you smile? Do you suffer from a constant, deep, anxiousness and restlessness that make any kind of peace, contentment, or happiness impossible to imagine? Do you tend to sabotage your relationships and /or employment? Have you spent time in and out of the rooms of the various 12 step or other recovery programs desperately seeking a solution or even a temporary reprieve from your futile attempts to numb the pain and suffering that is your constant companion? Do you think the only emotion you feel is anger? Have you endured hours in VA or private physicians’ waiting rooms hoping they might finally prescribe the pharmaceutical cocktail that will provide you with a little relief from the invisible wounds festering deep inside your mind? Do you want the suffering you live with on a daily basis, as a result of your military experience, to end before you give up and take you own life? If you answered “yes” to half of these questions, you may be suffering from combat trauma/PTSD*. You are not alone! Tens of thousands of warriors are suffering because of combat trauma experiences while serving our country. *You will notice throughout this book that I interchange or combine with a backslash the terms “combat trauma” and “PTSD”. I know that some of you may not be comfortable with the label of PTSD and that is completely understandable. Just know that when I am mentioning one or the other or combining them with a backslash, it is simply to be inclusive to all who might be reading this book. The Art of Healing from War guidebook is an introduction to a practical path and practice through combat trauma, communicated in military language, utilizing warfare strategies and tactics to increase self-awareness and begin the path to healing and wholeness. I have not discovered a new spiritual truth, uncovered a forgotten ancient philosophy, or created a shortcut to peace and happiness through some facet of the “positive thinking” ideology. The Art of Healing from War is based on my personal experience with combat trauma/PTSD and a path I found to manage and even begin to heal the hell it creates in my mind, in my life, and in the lives of those close to me. The following is a timeline of my trauma event, along with the consequences I created and endured as a result of undiagnosed, untreated Post Traumatic Stress. As a loved one of a veteran I hope this segment of the book gives you a little clearer picture of the experience of combat trauma/PTSD. Although veterans do not have a monopoly on trauma unless you have experienced war you will never understand the affect it can have on the mind or your veteran. Love them, encourage them, be patient with them, but hold them accountable for their behavior. What they have experienced has forever changed them but they are responsible for finding a path which gives them the best opportunity to find peace. Many of your veterans who read this may feel that their combat trauma experience is much more “traumatic” than mine since I did not lose someone close to me, get blown up, did not see the blood spilt of those I killed, or experience some of the unimaginable things I hear from fellow veterans known only to those who have been in a war. Let me say this up front because it is vital to the path out of combat trauma. From my experience, working with veterans who have been diagnosed with PTSD, does not have to involve prolonged exposure to traumatic events. PTSD happens in an instant and the more “instants” you experience the more likely you are to have it. I have known veterans who received their trauma after killing a child in a fire fight, after seeing the dismembered remains of their buddy, to being the person who loads the transports with the coffins of the fallen. For those who received their trauma outside the typical direct combat experience there is an added element that contributes to the lethal aspect of PTS and that element is “shame”. It may, at this point, help to understand the difference between guilt and shame. Guilt is what we feel about something we have done; shame is what we feel about who we are. Guilt says, "I made a mistake.". Shame says, "I AM a mistake!". Many veterans I speak with experience shame because they have the symptoms of PTS without having experienced the horrors of direct combat. As we will discuss in more detail later in the book, shame makes a veteran less likely to face the reality of their trauma and therefore less likely to seek help. This scenario contributes dramatically to the suicide rate among veterans and also the number of veterans caught in the cycle of substance abuse, incarceration, and homelessness. Sadly, these veterans are also less likely to receive a diagnosis of PTSD from the Veterans Administration because they did not participate in direct combat; therefore, confirming their shame.